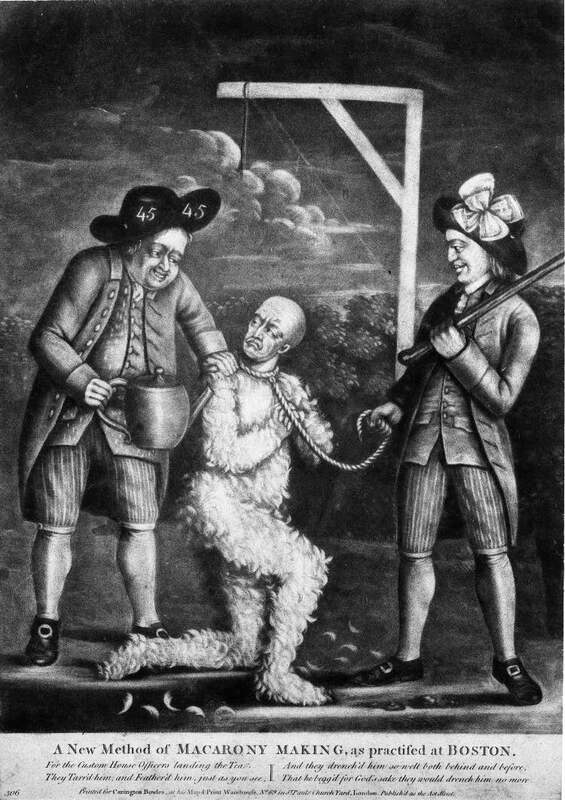 On September 6, 1776, Peter, a slave from Salem County, New Jersey, ran away from his master’s property wearing “a white jacket with a belt before.” Charles Sherry, a convict servant, escaped from William Scott of Dumfries, Virginia, on February 7, 1777, wearing “a greenish coloured coat and jacket, with a belt round the bottom of his jacket.” On November 29, 1781, Jesse Vickars broke out of jail in Newtown, Pennsylvania, wearing “a red belted waistcoat.” These excerpts from newspaper advertisements describe a specific type of man’s garment known during the late eighteenth century as a belted waistcoat or belted jacket, which comprises a waistcoat body, cut square at the bottom, and a matching, detachable belt fastened to buttons on the waistcoat and worn around the belly. Evidence of belted waistcoats exists not only in descriptions of runaways dating to the late eighteenth century but also in uniform prescriptions of the Continental Army during the American War for Independence and in paintings of the period. Previous to this study, however, no belted waistcoats or corresponding belts were known to survive in American museum collections. The printed linen band purchased by Winterthur at the 2014 Delaware Antiques Show may be the first identified material evidence of such a garment. Not knowing the specific purpose of the band at the time of purchase, the museum acquired the piece with the intention of conducting further research. The previous owner, Sumpter Priddy III, thought that the textile might be a “stock” that buttoned around a man’s shirt collar. Winterthur’s Senior Curator of Textiles Linda Eaton suggested that it might be an armband. My conclusion—that this band is a belt for a waistcoat—emerged following a conversation with Alden O’Brien at the Daughters of the American Revolution Museum and a review of the textile’s size and six buttonholes. O’Brien encouraged me to think about a man’s waist in relation to the dimensions of the band. At 17.5 inches, the length corresponds to half of a 35-inch waist, a practical size for an adult male. Henry Benbridge, Captain John Purves and His Wife, Eliza Anne Pritchard, oil on canvas, 1775–77. 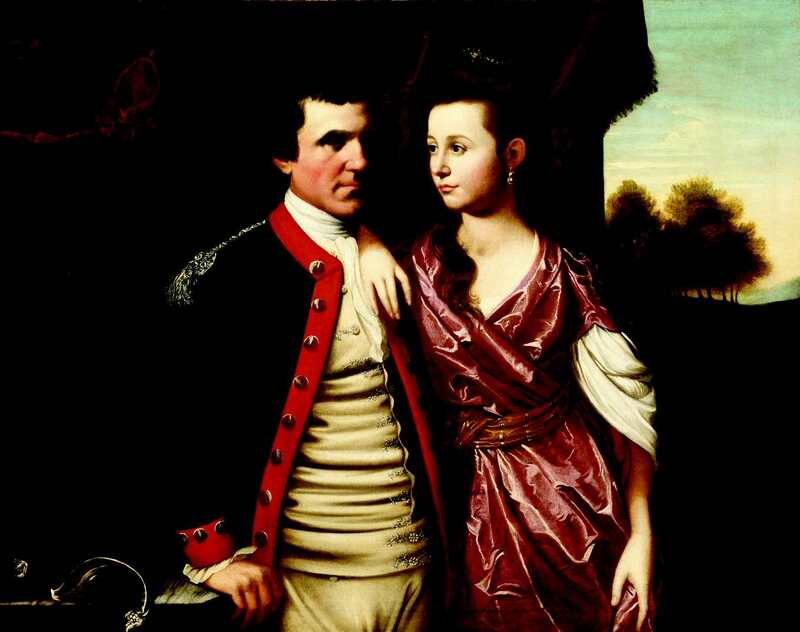 This consideration led me to a painting in the Winterthur collection, Henry Benbridge’s Captain John Purves and His Wife, Eliza Anne Pritchard. In the portrait, the South Carolina military officer wears a belted waistcoat decorated with embroidered florets around the belt’s two central buttonholes. Upon measuring the distance between the central buttonholes of the Winterthur band, I verified that it does match typical buttonhole spacing for waistcoats of the eighteenth century. The two buttonholes at each end of the belt may have attached to buttons on the side of the waistcoat. 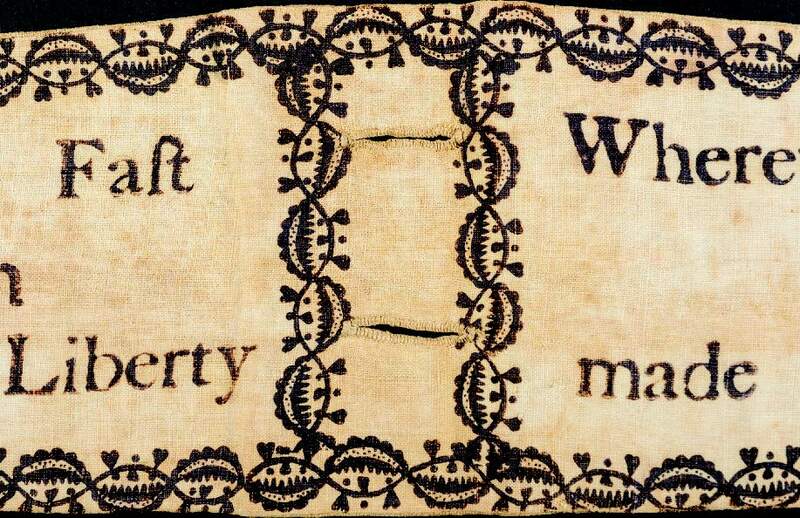 Printed on one side of the Winterthur belt is a border pattern as well as a rewording of Galatians 5:1, from the New Testament, “Stand Fast / in / the Liberty / Wherewith Christ / has / made you Free.” Sumpter Priddy has associated this verse with early American Methodism, as John Wesley, the English founder of Methodism, used the exact wording in letters to three different followers in the 1770s. The verse, however, also has ties to the American Revolution. At least five New England preachers mentioned it in sermons about American liberties delivered between 1773 and 1778. In Boston, 1773, Simeon Howard’s sermon to the city’s Ancient and Honorable Artillery Company focused on the verse. His commentary on defending liberty is striking: “Now for men to standfast in their liberty means, in general, resisting the attempts that are made against it, in the best and most effectual manner they can.” An even more compelling example is a sermon delivered to the First Battalion of the Philadelphia Associators by Jacob Duché, rector of Christ Church inPhiladelphia, on July 7, 1775, titled “The Duty of Standing Fast in Our Spiritual and Temporal Liberties.” It was dedicated to George Washington and the recently established Continental Army and frequently referenced Galatians 5:1. Advertised in Philadelphia newspapers and reprinted across the Atlantic, the sermon gained widespread popularity. In light of this evidence, I speculate that the Winterthur waistcoat belt may have been made in support of the ideology expressed in one of the radical sermons. This political purpose connects the belt to other material culture of the period referencing American liberty. In 1775 militiamen of the newly formed minute battalions in Tidewater and northern Virginia wore linen hunting shirts with Patrick Henry’s slogan “Liberty or Death” sewn onto the breast. Metal “45” pins showed support for John Wilkes’s radicalism in Parliament and his advocacy for the liberties of the thirteen American colonies. The 1775 satirical mezzotint A New Method of MACARONY MAKING, as practiced at BOSTON depicts such adornment. Apart from clothing, American militiamen and Continental soldiers showed their support for independence, General Washington, and the Continental Congress on powder horns, weapons, cartridge boxes, and other accoutrements— all examples of the material culture of display. As a conspicuous expression of political ideology, Winterthur’s waistcoat belt certainly fits into that culture. As a rare surviving artifact, perhaps more important is the possibility that its identification as a waistcoat belt might lead to further study of this heretofore largely unrecognized article of male clothing. This entry was posted in Academic Programs, American Culture Studies, Decorative Arts, Delaware Antiques Show, Members, museum collection, Students & Alumni, Uncategorized and tagged America, Henry Francis du Pont, museum, objects, textile, Winterthur Garden, Winterthur Museum, Winterthur Program in American Material Culture. Bookmark the permalink.